Safety: Newton Mustangs Youth Football and Cheer make player safety our top priority. 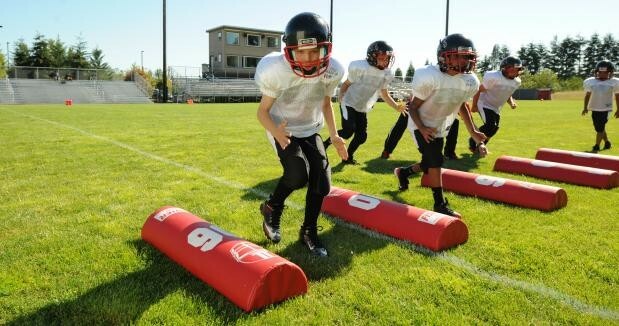 Prior to the Mustang football season all Head and Assistant Coaches are required by AYF to take multiple youth football safety training courses and must get certified for both CDC HeadsUp Concussion and AYF Human Kinetics Safety & Health courses. At least one coach on every Newton Mustang Team is required to be CPR Certified. American Youth Football required to have at least one Certified Athletic Trainer or EMT at EVERY football game. PreSeason Practice: Preseaon football begins the 1st week of August. All players are required to participate in a minimum of 10 hours of preseason practice prior to any contact football sessions. This allows proper conditioning and emphasis on proper form and safe football play. Players can not participate in games and will have limited practice participation until the 10 hours of non-contact/no pads practice has been completed. Weekly Practices: Practices are typically held Tuesday, Wednesday, and Friday evenings from 6pm to 7:45pm. Head coaches may vary from this at their discression. Mustang practices are held at either Albermarle Field or Highland Fields in Newton.The City of Newton will occasionally close all grass fields due to inclement weather which is beyond Newton Mustang control. Games: 1st game of the season is typically around Labor Day weekend. Regular season play consists of roughly 8 game games through late October. Based on team eligiblilty, teams may continue post seson play in AYF Playoffs. Home games are played at Newton North High School turf field. Away games are across the MA Bay State Football Conference team locations. See locations in menu section.